PPC Posting Board - Friday Forum: It's this thing again! Friday Forum: It's this thing again! As always when discussing the news, please remember that not everyone will agree with you. You're free to state, discuss, and defend your viewpoint (provided it does not violate the Constitution), but please don't use that fact to attack others. As we all know, Stan Lee died late last year, putting an end to a career that most people thought of as a continuous string of cameos. Except it didn't put an end to it, because the next World of Warcraft patch includes one. 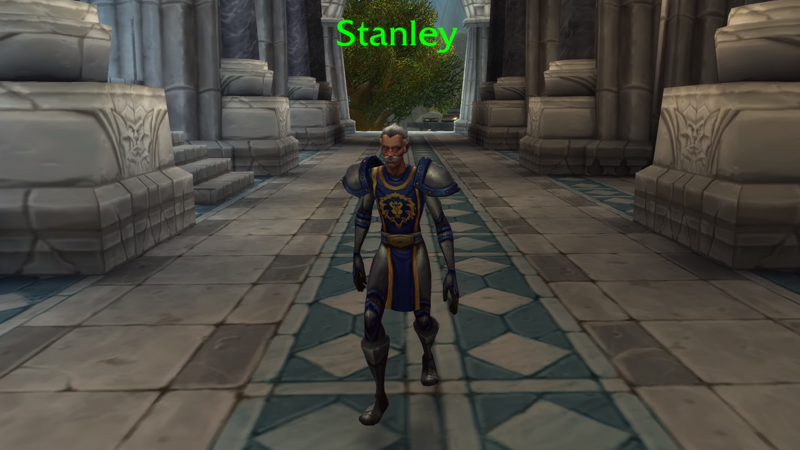 'Stanley', an elderly man with a very familiar looking face, apparently wanders around the Keep in Stormwind City - and yes, on entering the throne room, he reportedly exclaims "Excelsior!" So that's adorably silly. 80 years ago on Wednesday, Marguerite Perey, French chemist/physicist and protege of Marie Curie herself, discovered a new element. Realising that the reported radiation emitted by actinium didn't make a lot of sense, she purified some for herself (from samples of lanthanum, which she may have purified from uranium ore...) and did an intensive study of its decay. She realised that the reported radiation was actually from actinium's decay product, a brand new element she named francium (after, y'know, France). 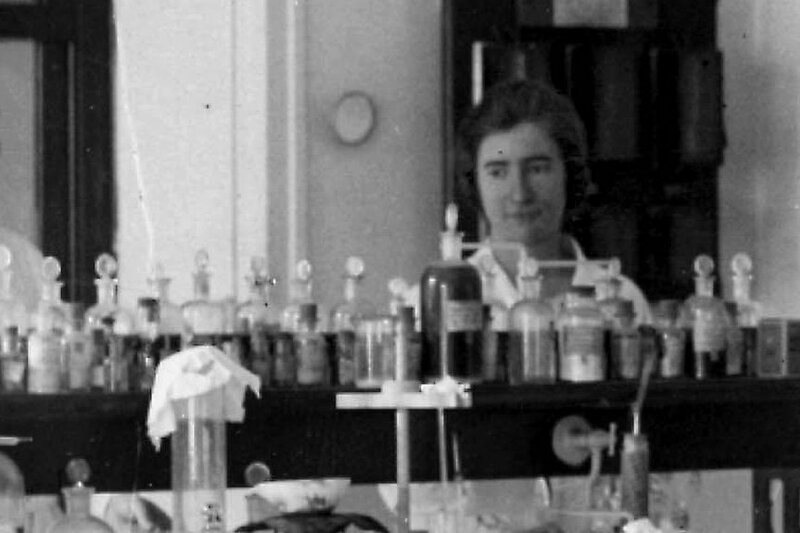 She went on to become the first woman elected to the French Academy of Sciences... and then died of cancer in 1975, because working with radioactive elements is seriously bad for your health. On January 1st, New Horizons - the probe that discovered the heart on Pluto back in 2015 - performed its second close flyby, of a Kupier belt object named (486958) 2014 MU69, and nicknamed Ultima Thule. This is the furthest object ever visited by a spaceship, and due to being out in the cold dark outer solar system, is basically unchanged since the solar system formed. Ultima turned out to be a reddish contact binary - two objects which fell gently against each other and stuck like that. Comparisons with snowmen and BB-8 have done the rounds, though the best response was Mira McKinnon on Twitter: "MU69 is Moo, our little space-cow". We should be seeing more results out of Ultima Moo soon - there's been a brief break as New Horizons swung behind the sun, but we'll be back on track soon. 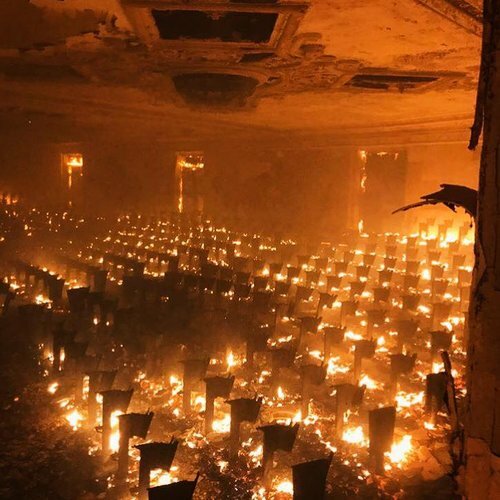 A conference for course coordinators and other non-canonical management of OFUs, held yesterday in the Small Auditorium at PPC HQ, had to be postponed indefinitely after a fire broke out in the room. Reports - by which we mean a hassled-looking Dr. Huinesoron of OFUDisc - say that a friendly competition between OFUM's mini-Balrogs and OFUN's mini-Dragons got out of hand, possibly with intervention from OFUO's mini-Furies. Reports that agents residing on the floor above the auditorium are trapped in their missions until DoSAT can be bothered to fix their consoles should definitely be ignored. 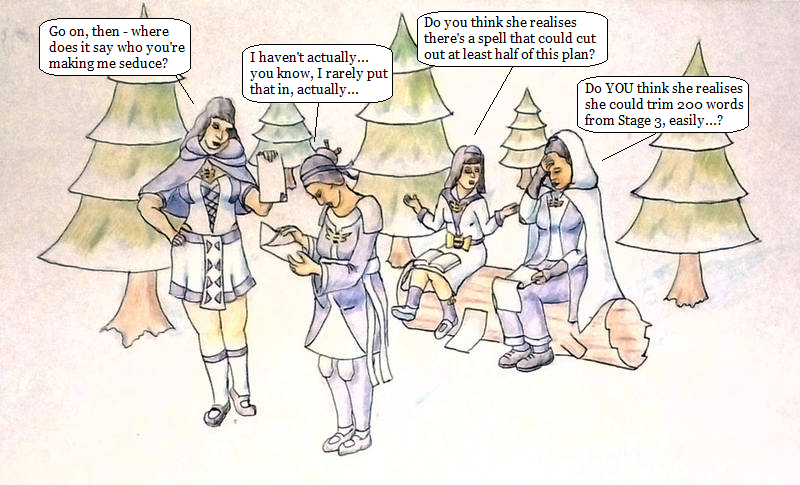 Nesh has already seen this one, but I don't think anyone else has... a party of four clerics. What could go wrong? The Order are actually parodies of Kaitlyn at different stages of her life, from 'scary-smart kid', past 'rebellious teenager', through 'hassled manager', up to 'bone-weary student'. There's at least one more picture in the works, but no story other than what you see in the image. But yes. If you DO want that, let me know. I can help.